New “axis-specified” search service for Wikipedia started! 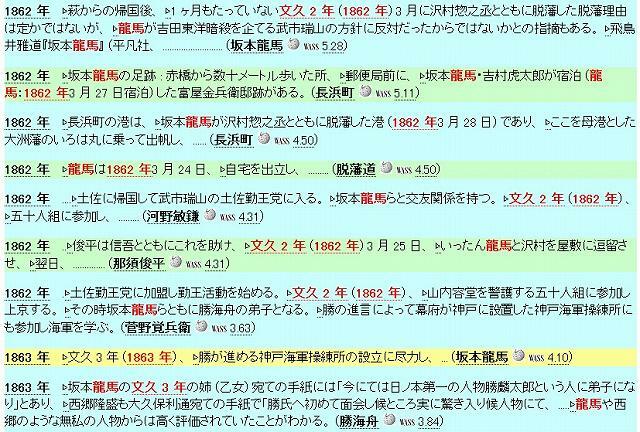 I started a new trial “axis-specified” search service for Japanese version of Wikipedia yesterday. This service was announced in Japanese blog pages such as “Wikipedia 「軸づけ」 検索のインターネット上でのサービスをめざして”. What you can do with WASS were described in DASYN.com blog pages: WASS - Wikipedia から整理された検索結果をえる検索サービス (WASS - a search service that generates arranged search results), and 機能の概要 (Outline of functions). I prepared 使用の手引 (Users' Guide) too. I often write articles in its own blog too. The following example shows a search result of “Ryoma” (Sakamoto Ryoma), which is similar to a year table. Another seach function that sorts search results by areas. There are still many problems on this service. So I have not yet advertise this service. One problem is that only one user can use this service at once (and only a few users can use it) because there is only once PC server. Another problem is that there are still many bugs. The service is 24-hour basis but it may stop a while because thre is no back-up service. This page contains a single entry from the blog posted on December 14, 2009 9:20 PM.